Six of the Struve Geodetic Arc measurement points in Finland have been selected as UNESCO World Heritage Sites. Information about Struve Geodetic arc in orher countries, you can find here. Mustaviiri is an island near Pyhtää in the Gulf of Finland National Park. The island is a treasure trove of cultural history sites, such as the southernmost Finnish station point of the Struve Geodetic Arc. Towards the southern horizon, you can see the Russian island of Gogland, where the two protected Russian station points are located. The Struve station point is located in the middle of the island on bare rock. Next to the station point there is an observation tower and the remains of the old triangulation tower. On the island, there is a cultural heritage and nature trail that is approx. 1.6 kilometres long and that passes the measurement point. Along the trail you can also take a look at the remains of an old island croft, a stone labyrinth, a shore stone field and war memorials. Each year about 1 000 tourists visit Mustaviiri. Most of these people climb the observation tower next to the Struve station point and visit a World Heritage Site. There is no regularly scheduled vessel traffic to Mustaviiri. The only way to reach the island is by your own boat or by boat taxi. Several entrepreneurs are active in the area and you can ask if one of them could transport you there. The island is located in the open sea and fairly exposed to wind, which means that access to the island can never be guaranteed. There is no pier on Mustaviiri, so visitors must dock at the breakwater. On Mustaviiri Metsähallitus provides services for visitors, consisting of a campfire site that includes a supply of firewood, dry closet, observation tower, breakwater for docking and a marked nature trail and signs. More information about services available in the National Park. The services available in the cities of Kotka and Loviisa are about 30 kilometres away by boat. The location of Mustaviiri on map. The Porlammi station point is located on Tornikallio, in the municipality of Lapinjärvi at lake Pyhäjärvi. At the top of the rock Tornikallio there is a dry heath with pines. It is a commercially managed forest. 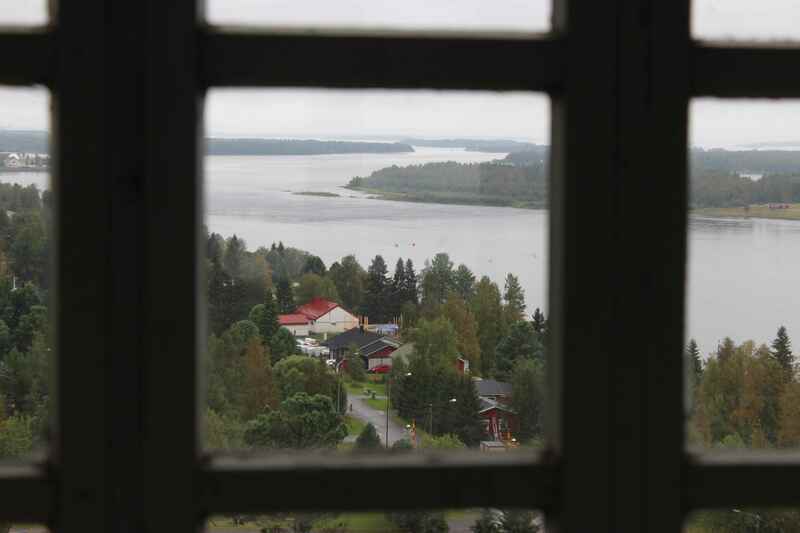 At the top of the rock, there is a magnificent view of Pyhäjärvi. The slope of the rock is very steep, so watch your step! The station point at Porlammi is a weatherbeaten borehole in the rock. Next to the station point there is a sign containing information about geodetic measurements. The trail leading to the station point is demanding and not suited to the physically impaired. The distance between the road and the Struve station point is about 500 metres, but the trail is difficult and the top of Tornikallio is about 50 metres higher than the starting point of the trail. The sign containing information about the Struve measurements is at the start of the trail. The location of Porlammi on map. The Puolakka station point at the top of Oravivuori is located at Korpilahti, Jyväskylä. This is the most famous of the Finnish World Heritage station points. It is located at the top of a hill, so you need good hiking equipment when you visit. In 1997, a replica of the original triangulation tower was built as an observation tower near the station point. The view from the tower is beautiful. The Struve station point, a borehole in the rock, is next to a concrete pillar. During the last few hundred years, many geodetic measurements have been carried out at Oravivuori. The distance from the parking area to the Struve station point is about one kilometre, but the ascent is about 90 metres, which makes the walk a challenging one. A signposted trail leads from the parking area to the station point. In particularly damp spots, there are duckboards, and there is a staircase on the steepest part of the slope. You can reach Oravivuori via two signposted gravel roads from highway 9. The distance from the highway to Oravivuori is about 10 kilometres along either route. Near Oravivuori, there is also docking space for boats. Watch the aerial video from Oravivuori. The location of Oravivuori on map. The Alatornio Church station point is easier to access than many others. The Struve expedition used the church tower to take measurements. The church has a long and interesting history. There has been a church at the site since the 14th century, if not longer. The current church was completed in 1797. In the beginning it was a Catholic church, but following the Reformation it became Lutheran. You can reach the church easily by car. The opening hours of the church are posted on the Tornio parish website (in Finnish). The location of Alatornio Church on map. Address to the Church is Kirkonmäentie 86, Tornio, Finland. Aavasaksa is a tree-covered hill at Ylitornio. It is a well-known tourist destination with lots of services and activities, such as a ski slope, nature trail and observation tower. Aavasaksa is one of the official National Landscapes selected by the Ministry of the Environment. An asphalt road leads to the Aavasaksa station point, so that it is accessible to everyone. The distance between the parking area and the observation tower is 400 metres either along the footpath or by road. Please leave your car in the parking area, even though the asphalt road goes right up to the tower. The Struve station point has been covered by the observation tower. On the observation tower, there is a sign with information and a plaque commemorating the Struve Geodetic Arc. The Struve Geodetic Arc is only a small part of local history in the area. The French astronomer and mathematician Pierre Louis Moreau de Maupertuis measured the length of a degree of arc of the meridian in the River Tornio valley in 1736–1737. It is the first significant triangulation survey in Northern Europe. The Maupertuis expedition was well documented. Expedition member, Catholic priest Reginald Outhier published an interesting and detailed travel account of the expedition, Journal d'un voyage au Nord. In addition to the measurements, the book offers very detailed descriptions of the conditions where the measurements were taken and documents how people lived in the area. The location of Aavasaksa on map. Address to the site is Aavasaksanvaarantie 279, Ylitornio, Finland. The Stuor-oivi station point is located in Enontekiö, in the wilderness of Tarvantovaara, at the top of the hill Stuorrahanoaivi. Stuorrahanoaivi is a flat fell in the treeless highlands of Lapland. In the wilderness of Tarvantovaara, it is possible to walk for long distances without meeting anyone. At the top of the fell, there is a sign with information about the World Heritage status of the station point. Behind the sign, a couple of metres away, there is a cross-shaped engraving in the rock that is related to the geodetic survey. The engraving was made in 1852 and it is an alternate marking of the actual Struve station point. The first station point measured in 1850 was destroyed by the Norwegians when they included it in their triangulation network in 1895. At this time, the engraving was replaced with a more visible central peg. Near the Struve station point there are also the remains of a triangulation tower and a rock cairn that may have been used as a beacon during Norwegian and Russian triangulation surveys. The triangulation tower was used in the triangulation survey of the Finnish class one triangulation network in 1969–1970. An astronomical positioning was done at Stuorrahanoaivi in 1988. In the 2000s, the National Land Survey positioned a modern control point (EUREF-FIN) near the tower. The Tarvantovaara wilderness is one of the quietest parts of Finland. Only a few trekkers find the area, because it lacks nearly all structures to facilitate trekking. Visitors are looking for peace and quiet and lots of space far from other trekkers. The Tarvantovaara wilderness is a mosaic of highland swamps, lakes and alpine birch woods. The land is mostly used as reindeer pasture. It is very difficult to reach the station point. From the nearest roads (two alternative routes exist) there is about 25–30 kilometres of roadless and trailless wilderness. The route to the station point has not been marked in the terrain. In practice, a visit to the station point requires between 1 and 4 nights spent in a tent or in an unlocked hut or cabin where anyone can spend the night. A visit to the station point is recommended for experienced trekkers. You can walk to the station point from the south, Lavivaara. If you do, there's a hut where you can spend the night at Syväjärvi. The distance from the parking area (address is Syväjärventie 1062, Enontekiö) to the hut is about 10 kilometres and from the hut to Stuorrahanoaivi about 15 kilometres. Most of the way, there is a track used by all-terrain vehicles. You can also walk to the station point from the west, from the Hetta-Kautokeino road. If you do, there's a hut where you can spend the night at Salvasjärvi. The distance from the road to the hut is about 15 kilometres and the distance from the hut to the station point is also about 15 kilometres. Part of the way, there is a track used by all-terrain vehicles. The location of Struorrahanoaivi on map.